I've heard it before mentioned in a social networking group, and thought that's nice. 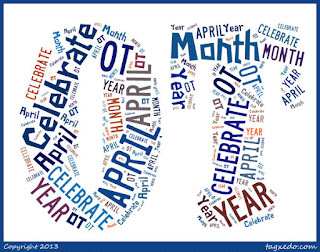 But never seen info of what OT month is, where it originated, what we as OT's should do. Then a few days ago, one of the OT groups I am a member of on FB changed the image to a heart with OT month on. This time I decided, that's great, I'll also showcase the profession for OT month. My first idea was, time to get my book out, what perfect timing. I mentioned it to two different OT's and neither said OT month has been. So here I am busily editing my book and wanting it out in OT month. I began sharing a video or two and then noticed, hm, April. So what is OT month? 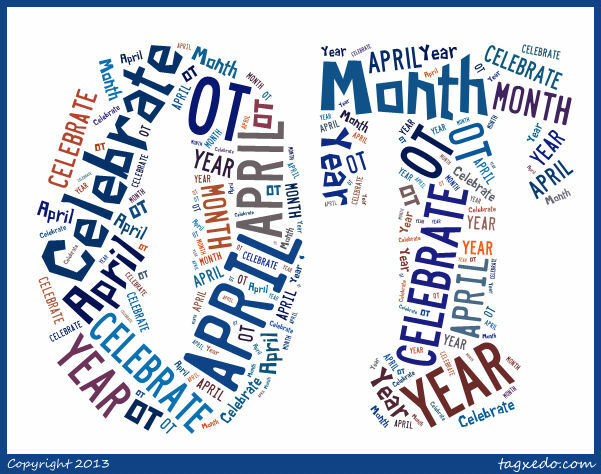 I did a google search and found the American OT Association or AOTA states OT month is: "April is OT Month - Celebrate it All Year! As an occupational therapist or occupational therapy assistant, you are part of a vitally important profession that helps people across the lifespan participate in the things they want and need to do through the therapeutic use of everyday activities." What am I doing showcasing OT month in June? Well hey, to me every day is important and OT should be receive publicity all year round. Actually, there are some really cute and cool videos out that students or OTs put quite a bit of effort into preparing to educate the public about the amazing profession of OT. So yes, on this blog it is June but these videos should be viewed regularly, not only in April. Actually, if you have visited this blog before, you will notice quite a number of videos illustrating different aspects of OT. Have a question about occupational therapy, post it below and I'll do my best to answer or to research for the most suitable response. Or stay posted for my book, due to come out very soon.